Scientists say the body of a prehistoric mammoth, found in Russia, can be preserved for another 500 years. 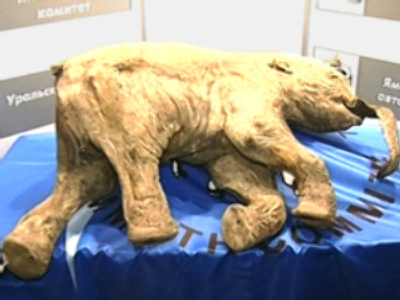 The frozen remains, weighing 50kg, were discovered in the Yamalo-Nenets region in the Urals May last year. “We’re planning to keep the mammoth for some 100 to 500 years, and a team of researchers is currently working on it,” said Bernard Buigues, vice president of the Geneva-based International Mammoth Committee. He said some experimental technologies will enable this to happen. One such technique, according to Buigues, requires certain conditions, like keeping the temperature -18 degrees Celsius and filling the room with a special gas. He said scientists will decide by autumn which conservation method will be used, and the long-lasting research is aimed at careful study of the unique find and looking for the best way to preserve it for as long as possible. “Better slowly, but with no mistakes,” Bernard Buigues explained. Lyuba – this is how the mammoth was called by the researchers – is an outstanding discovery, as no one has ever found this animal so wonderfully preserved. Earlier Lyuba has traveled to Tokyo for scientific studies, and now the body is in St. Petersburg. The Yuribey River – the area where the unique body was discovered – also drew scientists’ attention. A special expedition there will be organised in August, which will also be joined by a National Geographic film crew.